Emerging risks and destabilizers as diverse as widening income inequality, slower growth, and climate change are reshaping Asia's economic landscape at such a rapid pace that governments must build far greater resilience into their national plans, says Independent Evaluation at Asian Development Bank (ADB)in Manila. "The urgency for countries to adapt to the new environment is growing," concludes Independent Evaluation's 2016 Annual Evaluation Review of ADB's operations and challenges for the region. Countries in Asia are already grappling with slower growth and falling international trade, and need to find new drivers for growth while extracting extra mileage from existing industries. Asia today is more exposed to external shocks through the closer integration of global markets. The region's economic prospects are also increasingly linked to the ability of the People's Republic of China and India to address their economic, environmental, and climate challenges. "External shocks-irrespective of their origin-quickly push the vulnerable below the poverty line and the poor deeper into poverty," says Vinod Thomas, director general of Independent Evaluation. Latest data for extreme poverty in Asia and the Pacific-based on a person living on less than $1.90 a day in 2011 purchasing power parity terms-is just over 450 million people. More than 1.3 billion people-those living on less than $3.10 a day-are at high risk of falling back into poverty again because of their vulnerability to shocks and the proximity of their incomes to the poverty line. Meanwhile, inequality is rising in a number of the region's more populous countries, and the provision of basic services is under severe pressure in some countries. "Building resilience calls for quality investments in infrastructure and institutions. But it must go beyond buffering shocks and preventing contagion," says Thomas. "Countries must vigorously promote social inclusion and environmental sustainability, both involving private sector solutions, to ensure that Asia's economic growth does not peter out." The report warns that development gains can be worn away by the rising frequency and ferocity of natural disasters, and the degradation of the environment. 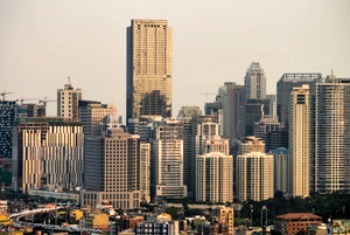 As the benefits and costs of Asia's growth are increasingly manifested in cities-Asia's urban population is expected to nearly double from 1.6 billion in 2010 to 3.0 billion by 2050, while 13 of the world's 23 megacities are located in the region-addressing urban issues such as water supply, sanitation, and waste management will be key. The private sector can be instrumental in providing innovative approaches to service delivery, as, for example, witnessed in the distribution of fluorescent lights in the Philippines. The review found that for 60 percent of ADB's private sector investment projects, both development results and ADB profitability were high, highlighting that development impact and profitability are not at odds with each other. A major theme of the report is the immediate need to sustain strong and inclusive growth. "Strengthening how new infrastructure can reduce the opportunity gaps between income groups is particularly important in Asia, where most of the world's poor live," says Jiro Tominaga, the report's lead author. "Take the quality of piped water: the better-off can always buy bottled water, but this is beyond the means of the poor." "Lenders for development such as ADB need to work with countries to weigh the benefits and costs to the affected communities of the infrastructure projects that they help to fund," says Tominaga. The increased demand for better public services and social welfare programs from the many countries across the region that have transitioned to middle-income status over the past decades will continue to shape ADB's agenda. In 2015, Bangladesh, Myanmar, and Tajikistan moved from low-income to lower middle-income status, based on World Bank income measures. By 2020, ADB expects that Indonesia, the Philippines, and Sri Lanka to reach upper middle-income status. The review found a significant improvement in operations outside ADB's main focus on infrastructure, particularly in education and public sector management. It recommends that ADB continue its focus on infrastructure given its potential impact on economic growth and for promoting inclusive growth, but complement that effort forcefully in non-infrastructure areas. It also points to the benefits of due diligence in operations-projects with high environmental risks which require additional safeguards perform better than others. Similarly, projects involving development partners, cofinancing, and regional cooperation do better because of the greater care that goes into these efforts. ADB lending for climate-change-related projects is set to double to $6 billion in 2020 from 2.8 billion in 2014, bringing support for climate change to about 30% of total lending. This laudable direction needs to be underpinned by strong institutional arrangements to achieve them. Climate change and environmental sustainability need to be at the center of ADB's operational strategy for the institution to align itself with the global actions to respond to climate change and achieve sustainable development. "As the environment in which the Asian and Pacific countries operate changes, ADB also needs to change," says the report, noting that the Sustainable Development Goals, the global climate change agreement, and the entry of two new lenders for development will affect the strategic direction taken by ADB, which is readying its long-term development strategy to 2030.